Old Longmorn can be a very wonderful thing, as a number of more experienced drinkers than me attest. I’ve not had very many (and have only reviewed one) but each one that I’ve had has been excellent. This one is no different. I’ve tried it on two previous occasions. First at a small potluck gathering earlier this year that featured sherry matured whiskies (I contributed this single oloroso cask Glendronach) and then again at the recent birthday/wedding whisky blowout where it was one of the whiskies outside the main flight available for guests to sample as substitutes (I drank it in place of the Glen Ord 30 which I know very well). On both occasions it held its own (and then some) against some very high-powered whiskies, despite being bottled at only 43%. I am very glad to have the opportunity to taste it again in a setting where I can record detailed notes. Palate: A very soft and unassuming and even somewhat watery entry but then, pow! a huge fruit cocktail just uncoils on the palate and just keeps on uncoiling and uncoiling. Citrus here too, and some tinned peach but mostly this is hugely tropical: mango, melon, papaya, pineapple, and all balanced between tartness and sweetness. Some salt too. Not much else past the immense fruitiness but I’m not complaining. Wait, with time there’s some white pepper along with the salt and a greater muskiness (very ripe musk melon). Water makes the fruit more immediately apparent (removes that initial lag) and also brings out some sweetness. Finish: Medium-long. The fruit keeps going and then when it’s gone the wood takes over. But this is not tannic at all–it’s very pleasant, toasted wood. Water keeps the fruit going even longer. Comments: I can only imagine what this would have been like at a higher strength, but hey, I’m not going to complain because this is pretty damned good as it is. And despite the low strength it actually does well with water. I can’t quite explain that or how a whisky this old has so little wood influence. Any ideas? Thanks again to Rich for the sample! 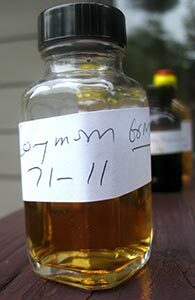 This entry was posted in -Whisky by Rating, 90-94 points, Gordon & Macphail, Longmorn, Whisky by Bottler. Bookmark the permalink.